The first reason listed is bacteria. 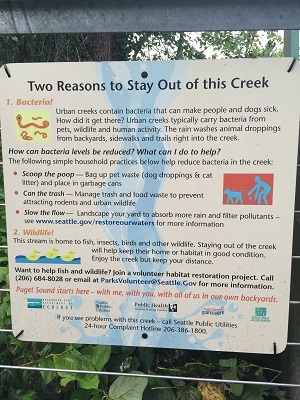 It states “Urban creeks contain bacteria that can make people and dogs sick.” It goes on to explain how bacteria gets into the creek and what you can do to reduce the bacteria in the creek. Excellent points … the last thing you want is to be sick! The second reason listed is wildlife. “This creek is home to fish, insects, birds and other wildlife. Staying out of the creek will help keep their home or habitat in good condition.” This appeals to your desire to help protect the environment. In the creek situation, the first reason was how your choice might affect you. You might get sick if you go in the creek. The second reason explained how your choice might affect others like the animals. How could this apply to parenting situations? It’s more powerful to explain possible consequences of choices to your kids rather than to tell them what to do. For example, instead of telling your kids not to use drugs, tell them what is likely to happen to their brains and bodies if they use drugs. My kids were horrified when they saw pictures of people who had been doing meth for a couple years. Their teeth were black and rotten. Their faces were sunken with sores all over. This left a huge impression on them! You could also tell them how a choice to use drugs is likely to affect others. Kids who use drugs need money for those drugs and often turn to stealing to get that money. Family members may no longer feel comfortable having those kids over to their house due to having things stolen. Whenever possible use real stories to highlight the consequences of choices. You can use stories from your family and friends or news stories. Another example is when you take young kids to the store. Instead of telling them to stay right by you explain why keeping close to you is in their best interest. You might mention that they will feel scared if they can’t find you and that you would feel worried too. It would also be good to tell them what to do in the unfortunate case that you do get separated. Teach your kids how to identify safe adults to ask for help. You might think that you should not have to explain your reasoning to your kids. If you give them an order, than they should obey – no questions asked. However, when you give your kids orders and rules, you are doing the thinking instead of them. What happens when you are not around to give the orders or ensure the rules are followed? Help your kids consider the consequences of their choices. This information will empower them to make wise choices not simply obey rules. When you can count on your kids making wise decisions on their own, your parenting job is so much easier!